In a curiosity venture to see if the Union of Concerned Scientists regurgitation of the “reposition global warming” accusation narrative was getting any media traction, I instead stumbled across an unexpected example of outright either deliberate misinformation, or one of otherwise incompetent reporting from someone who is supposed to be an authority on the topic of ‘industry-corrupted skeptic climate scientists’. 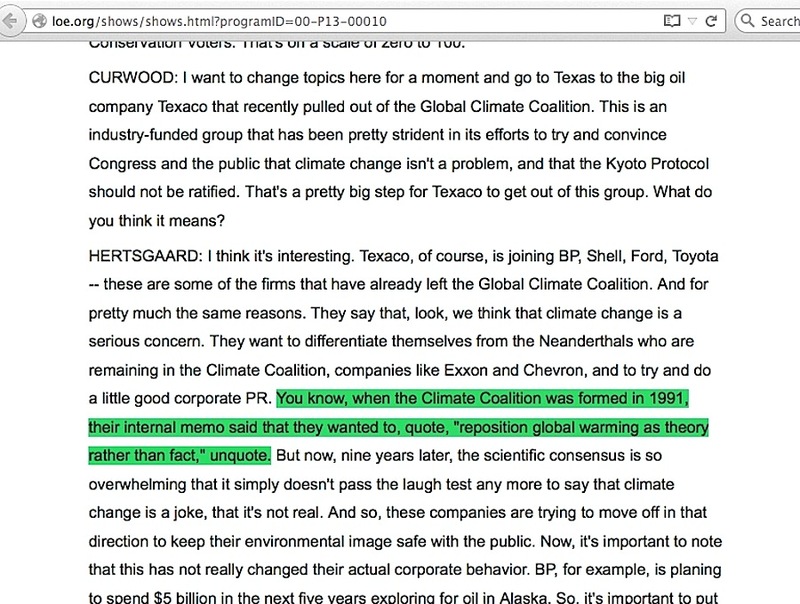 I use the word ‘authority’ loosely here in the case of Hertsgaard, as he, like the UCS, is really nothing more than yet another person enslaved to the accusation against skeptic climate scientists most famously first seen in Ross Gelbspan’s 1997 book. 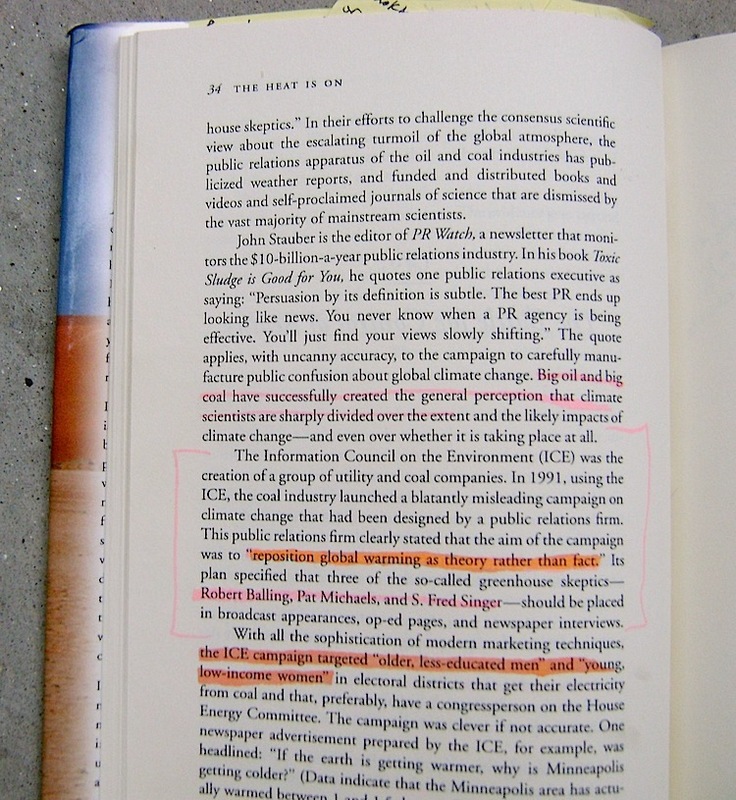 No ambiguity about it, Gelbspan ties the “reposition global warming” phrase straight to the Western Fuels Association, and Hertsgaard was one of the first writers to praise Gelbspan’s work only months after the book came out. … Texaco, of course, is joining BP, Shell, Ford, Toyota — these are some of the firms that have already left the Global Climate Coalition. And for pretty much the same reasons. They say that, look, we think that climate change is a serious concern. They want to differentiate themselves from the Neanderthals who are remaining in the Climate Coalition, companies like Exxon and Chevron, and to try and do a little good corporate PR. You know, when the Climate Coalition was formed in 1991, their internal memo said that they wanted to, quote, “reposition global warming as theory rather than fact,” unquote. Even worse for Hertsgaard, he makes a secondary blatant error with the bit about the GCC forming “in 1991.” Readily accessed GCC web pages at the time (screencapture here) clearly show them saying the GCC was created in 1989. 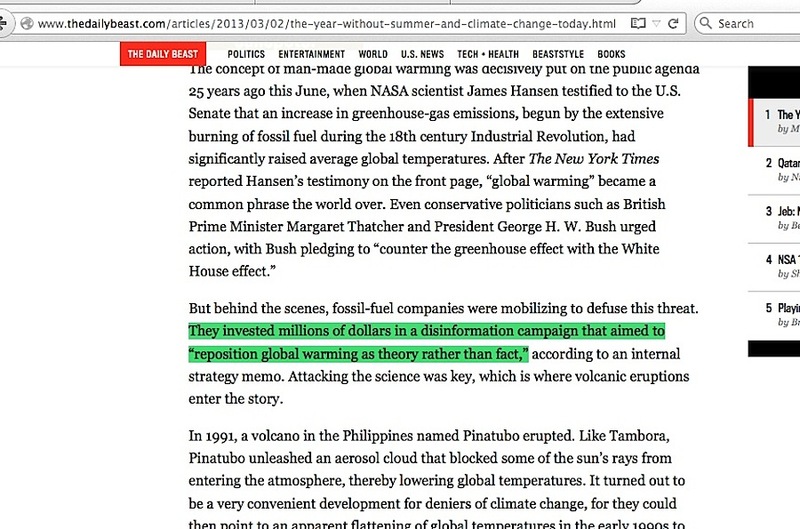 … After The New York Times reported Hansen’s testimony on the front page, “global warming” became a common phrase the world over. Even conservative politicians such as British Prime Minister Margaret Thatcher and President George H. W. Bush urged action, with Bush pledging to “counter the greenhouse effect with the White House effect.” But behind the scenes, fossil-fuel companies were mobilizing to defuse this threat. They invested millions of dollars in a disinformation campaign that aimed to “reposition global warming as theory rather than fact,” according to an internal strategy memo. As ever, one more person in an ever-spreading lineage of people hurling the ‘disinformation’ accusation against skeptic climate scientists, enslaved to the same ‘smoking gun’ phrase everyone else is, who is plagued with one of two very damaging appearances: he’s either engaged in the exact tactic he loathes, or he is literally clueless to how his and others’ narratives about ‘corrupt skeptics’ doesn’t line up right. Misinformation, either deliberate or from sheer incompetence, there is no other way to explain it. 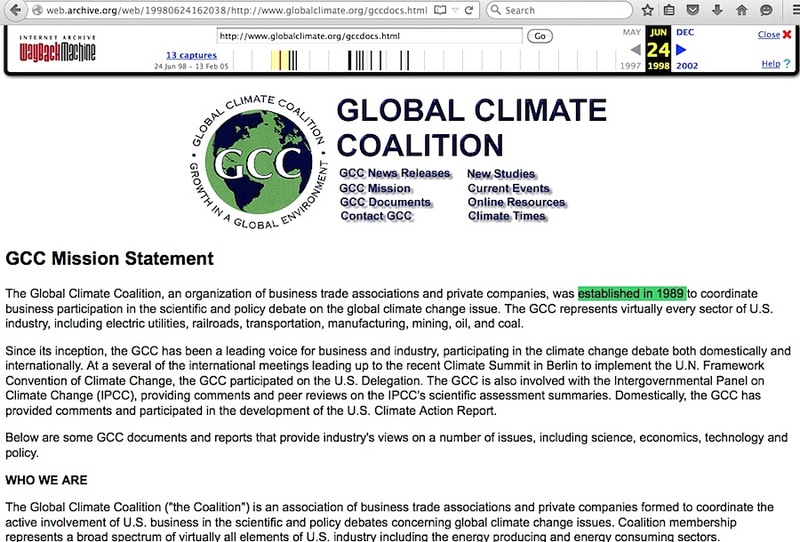 This entry was posted in Character assassination, Global Climate Coalition, Repeated talking points, Western Fuels Association and tagged Mark Hertsgaard by Russell Cook. Bookmark the permalink.